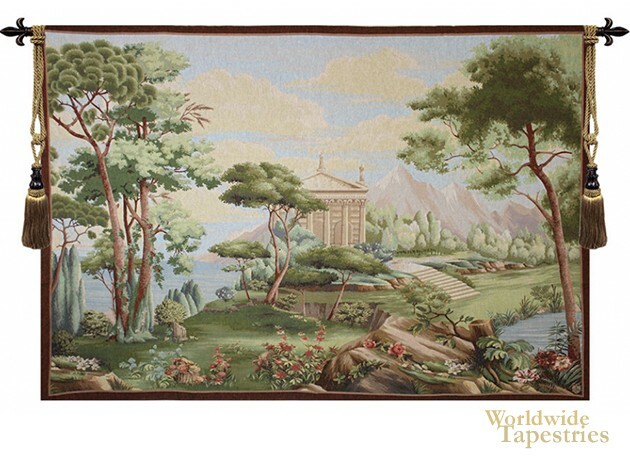 In Jardin Panoramique Grande tapestry we see a luscious scene of gardens, flowers and lakes amongst a palatial building. In this work, we see an idyllic landscape of lakes, gardens and mountains, where elements of nature combine with the monument of the garden, in a finely balanced piece of greens, browns, punctuated by red flowers. This tapestry Jardin Panoramique Grande is backed with a lining and a tunnel for easy hanging. Note: tapestry rods and tassels, where pictured, are not included in the price. Dimensions: W 87" x H 60"